Sorry to harass you on this fine weeknight … but I’ve made this comic … it took a while … and I’m trying to flog it to unsuspecting citizens of the web such as your good self. It’s called THE LONG WEEKEND IN ALICE SPRINGS. Preorders through the POZIBLE campaign will wind up on December 12th! If you don’t preorder then I can’t guarantee that you’ll get a copy later on in the piece SO ACT TODAY!! It’s only $30 for those lucky-ducks who live in Australia (postage included), there’s also some other options up for grabs if you’d like a little more stuff!! Books will go out in the post March 2013!! Included in the book is a beautiful new piece of writing by Craig San Roque which is … quite frankly – poetry! – then feel free to join this facebook page. Below is a page I did as an early trial when I was still working out what kind of structure I wanted the pages to have (i.e. panel structure), I was also trying out a few fonts at the time, I reckon I must’ve worked on the script after I did this because I have scrapped all of the words that were here … I just unearthed it in my computer today … I think this must have been from late 2009 or early 2010. GO HERE TO THE POZIBLE SITE and preorder the comic to help me get a print-run. This is a big call-out to all those interested in the project of the Long Weekend comic. I’ve heard enough people say that they’d love to see this comic in the flesh so they can truly digest it all in one long sitting rather than in the bits that I’ve doled it out on this website – now’s your chance!! I’m asking for your help over the months of October to December, hopefully we can raise some cash so I can get a print-run of about 300-400 copies of the book. 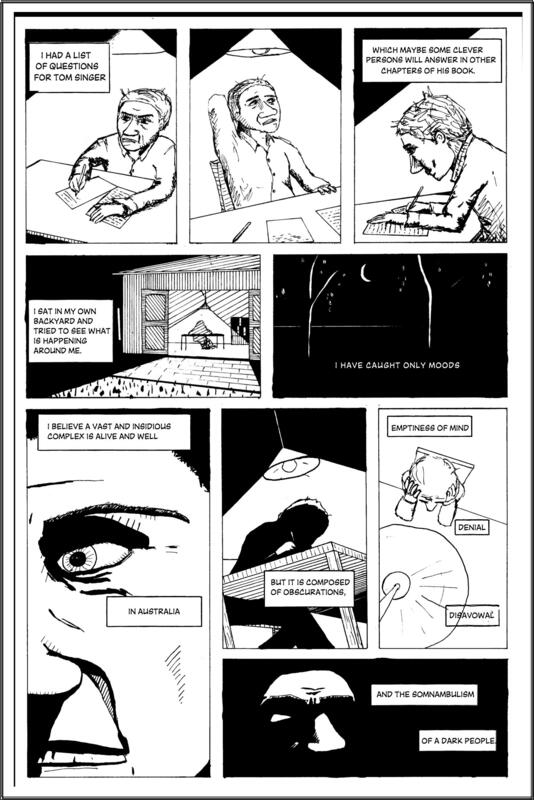 I’ve been slaving away on this comic for a few years now … it’s an adaptation of a psychological essay written about a Jungian concept called the Cultural Complex. The comic is about different cultures in Central Australia, it’s about all of Australia … it’s about all cultures … it’s about the cultural mind of the group. It’s both sad and funny, horrifying and witty … and it’s almost ready to be turned into a BOOK !! I’m really hoping it’ll be a beautiful book and it’d be great to have your help to be able to do that !! You can read the bits of the comic on the website (http://www.joshuasantospiritoart.com), where I have been slowly putting it up page by page as they’re completed. The final book will have extra pages and notes and book design by Nadine Kessler (http://www.nadinekessler.com). The final copy of the book will also have a brand new piece of writing by Craig to go with the comic. I reckon he’s a smashing writer and a unique voice in Australian writing! * 2006 – Josh Santospirito reads Craig’s essay: The Long Weekend in Alice Springs whilst working in Indigenous communities in Central Australia as a mental health nurse. * Josh likes what he reads. * 2008 – He starts drawing parts of the Long Weekend in comic form … he decides that this is a very cathartic exercise to help digest the seeming chaos around him. * 2009 – He shows Craig San Roque. * Craig likes what he reads. * 2011 – He commences inking of those pages and showing people on his website. * People like what they read. * 2012 – He will COMPLETE the comic by November 2012, have the book designed by Nadine. … he will ask for help to print around 500 copies !!! * So that even more people will like what they read. * 2013 – January / February printing. March -send y’all copies. *and y’all like what y’all read. SO that’s it – I want you ALL to be a part of this project, making this comic into a printed version (as well as a proper-like E-book). If you don’t have a credit card or hate punching your numbers into the interwebs but you still want to support the project – get in touch at disco_jeans@yahoo.com.au and we can try to work something out. Anyone who hasn’t got the dosh CAN STILL HELP by linking to this on your social media of choice!